Cheers to our lady anglers. Ladies waiting to get on the boat. Cheers to lady anglers and big fish. These ladies are going out. They have a date with some tuna. The beauiful Athena rod for one lucky anglerette. This beauty is going to a lucky anglerette. A trio of lady anglers and their yellowfin tuna! Gift to all lady anglers from Rene Thorn! Watermelon raspberry mimosa. Who doesn’t love a gummy lobster on the rim? Our awesome crew supporting the ladies by wearing pink. Put your boots out for the tuna fairy. Our lovely chef Geri-Sue! Keeping our anglerettes fuul and happy. Teresa keeping the lady anglers happy. Down time is always fun times too. Nothing like smiling beautiful ladies enjoying their hobby together. Here is Sophie with our GCLA group. 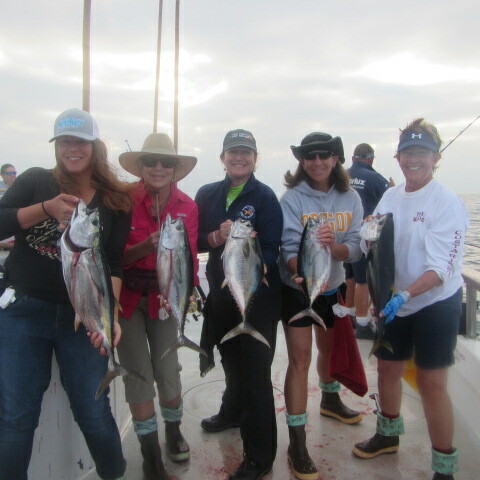 Our lady anglers in their Seeker Fishing Rods shirts. Rene and Justin with a healthly looking fish. XTRATUF days on the Searcher.